Need to flatter your way to the top of the Dresden Court? Giovanni Tiepolo’s got you covered. 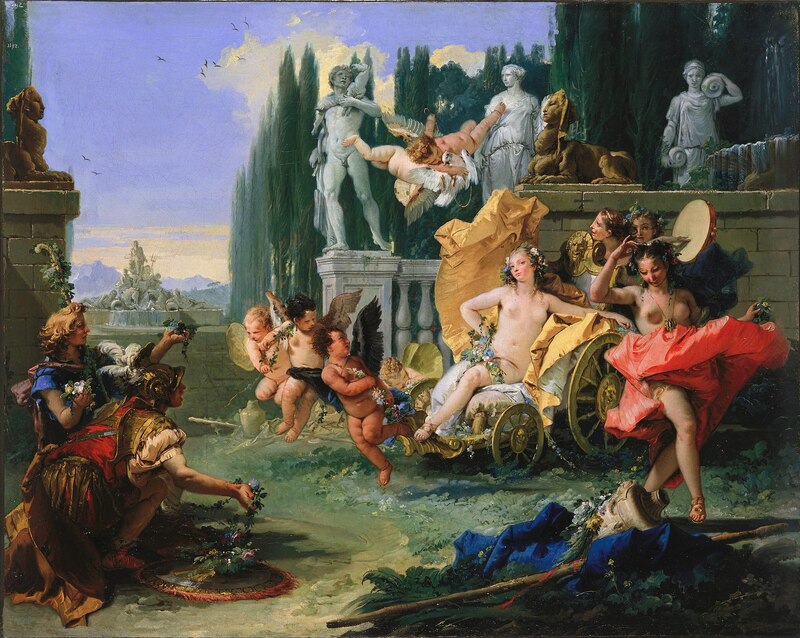 Tiepolo’s rendition of Flora comes from a long line of images of the Roman Goddess, who, oddly enough, was pretty unimportant to the Romans themselves. Goddess of flowers and the bloom of youth, Flora was a fairly minor figure in ancient Rome with several origin stories. According to Ovid, she was once a nymph named Chloris before she was raped by the Wind Zephyr, who made her Goddess of flowers to make up for abducting her. (Yeah, nice try, but that’s still not a good enough apology.) Lactantius and later Boccaccio, on the other hand, posited that Flora was actually just a wealthy prostitute. In either case, Flora didn’t truly blossom until the Renaissance, when artists such as Botticelli and Titian began depicting her with frequency (as in Primavera) after realizing that she would provide an excellent excuse for painting a scantily clad lady. Tiepolo was one of the last hangers-on of that Renaissance tradition, which he articulated in a Rococo language of curves, grandeur, and flights of fancy. This work situates a sassy-looking Flora on a golden chariot in an Italian-style garden, with admirers looking on while her entourage, including the chubbiest putti you ever did see (I’m talking rolls on their rolls, here), frolics around her. In keeping with artistic practice of the time, Tiepolo presents the scene as a performed fiction, meant to engage the viewer on an imaginative level. It’s full of splendid costuming and theatrical gestures, like a frozen moment in a grand opera, and you can tell Flora herself is really hamming it up. One of the things that contributed to Tiepolo’s success was the trace of sprezzatura, the studied nonchalance and effortless perfection so important to courtiers and artists of the time, that is visible in his work. His figures are carefully modeled and positioned, but the liveliness of the groupings and often painterly landscapes contribute to a sense of effortlessness. “I’m so talented, I don’t even try,” his paintings seem to say. Mid-18th century audiences couldn’t get enough of it. For a while, Tiepolo was the most prominent Italian fresco painter, entertaining offers from courts all over Europe. The commission for The Empire of Flora came from a unique and ambitious courtier named Francesco Algarotti, a Slytherin (possibly a Slyther-claw, as he was also a smartiepants) who had designs on the Dresden court. A Venetian like Tiepolo, Algarotti was a distinguished expert in many areas, including art criticism and philosophy. He also happened to be an exceptional courtier, possessing bucket loads of sprezzatura himself. What was his dearest wish, you might ask? Nothing more or less than an appointment in the court of Augustus III, Elector of Saxony and King of Poland. So, in 1743, he commissioned this painting (as well as one depicting Maecenas giving the Arts to Augustus) to give as a gift to Count Heinrich von Brühl, a powerful minister to the King and overseer of Dresden’s art collection. Brühl, who paid attention to artistic advancements and commissioned artwork from popular painters, was a man after Algarotti’s own heart. He was largely responsible for Dresden becoming both a serious art capital and the most sophisticated German court of the time. Just in case he wasn’t being ingratiating enough by commissioning two paintings from the hottest Italian artist at the time as a gift, Algarotti had Tiepolo paint into the background of The Empire of Flora a stone fountain in the shape of a Neptune group, the very same fountain that Brühl had earlier commissioned from sculptor Lorenzo Mattielli for the Palais Brühl-Marcolini. The clear implication is that, just as nature thrives under Flora, so too the city of Dresden flowers under Brühl’s touch. This sycophantic detail seems to have resonated because Algarotti was indeed appointed councilor. It just goes to show a little flower power can go a long way when mobilized for personal gain among the ultra-elite. Calasso, Robert. Tiepolo Pink. Translated by Alastair McEwan. New York: Knopf Doubleday, 2009. Hyde, Elizabeth. Cultivated Power: Flowers, Culture and Politics in the Age of Louis XIV. Philadelphia: University of Pennsylvania Press, 2005. Yonan, Michaal. “Dresden to Duchov” in Casanova: The Seduction of Europe. Edited by Frederick Ilchman, Thomas Michie, C.D. Dickerson III, and Esther Bell. Boston: Museum of Fine Arts Publications, 2017.